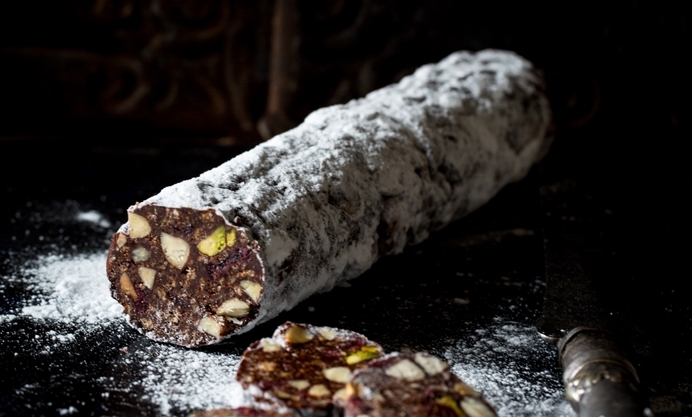 Louise Robinson's chocolate salami recipe is packed with festive dried cranberries, Amaeretto, almonds and pistachios. These make fabulous edible gifts, or delicious post-Christmas dinner petit fours. The last Sunday before Christmas is usually spent quietly in the kitchen, making edible gifts for friends and neighbours. There is something especially therapeutic about pre-Christmas baking, the calm before the storm. I do vary what I make every year according to my mood, but inevitably I always include chocolate salami, it is so simple to make. 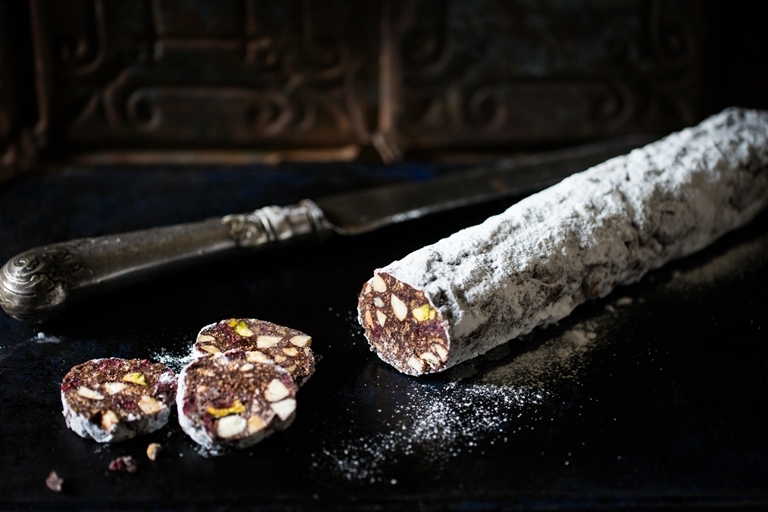 Chocolate Salami or 'Salame di cioccolato' in Italian, which naturally sounds so much better, is often served as a dessert in rural trattorias in Italy. The Portuguese are also very fond of 'Salame de Chocolate', where it is made with Maria biscuits which are similar to our rich tea. There are many variations according to country and region but essentially this decadent treat is made with good quality chocolate, dried fruit and alcohol. I love the combination of slightly sweetened cranberries that still have a hint of tartness, toasted almonds, crushed amaretti biscuits and a handful of gloriously green pistachios. I used Amaretto liquor, but you could substitute with your favourite rum or brandy, or leave out altogether to make it child friendly.